The Man at Arms Collection (MAA) by Coldsteel is a tribute to the veterans of medieval warfare. The man at arms was a tough battle seasoned fighter who fought alongside the knights. Though not officially a knight himself they would train with the knights and were just as skilled and deadly. These skilled fighters are dependable, competent and trustworthy fighters who could be trusted as a brother and would be less likely to flee the battlefield when things became tough like a lesser trained soldier. 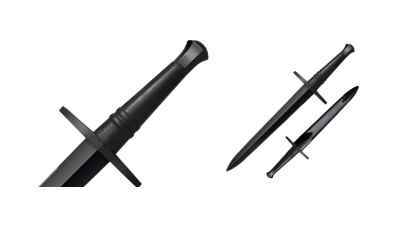 The Man at Arms Hand dagger is a matching companion to the full length Hand and a Half sword. 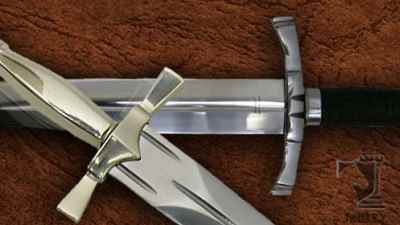 These pieces are designed to complement each other for a lethal pair of medieval armaments but stand alone as well. The dagger is made from a hand forged high carbon steel like the originals and comes complete with a full leather scabbard. A dagger like this is fully capable of battle but as daggers were; it is just as suited for carving yourself the perfect cut of meat at the next medieval feast. The MAA dagger comes with a sharpened edge.